So, by now it should be no secret that I am super proud of my dog Clark and his amazing agility career. I found him when I just started my masters degree in Kansas when he was around 6 months old, and we started agility to STOP HIM FROM EATING MY TEXTBOOKS (the blinds, a bag of razors, my clothing… the list goes on). 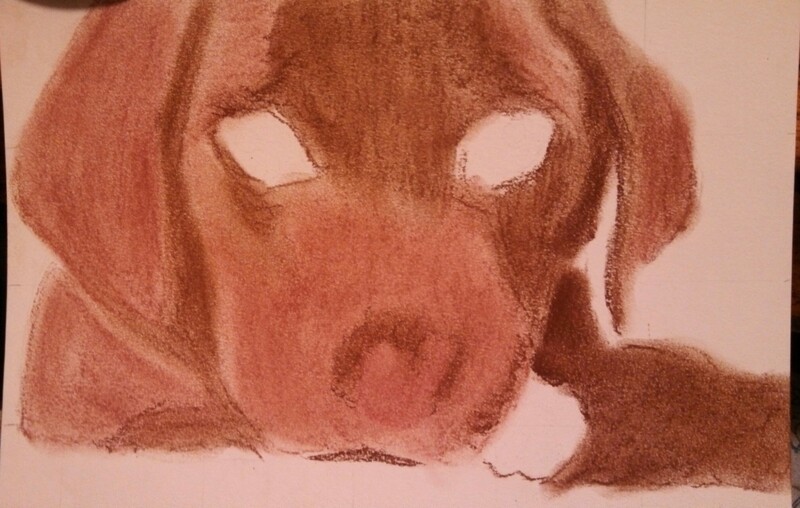 Anyways, I never got to own him as a puppy, and I wanted to recreate what he could look like. 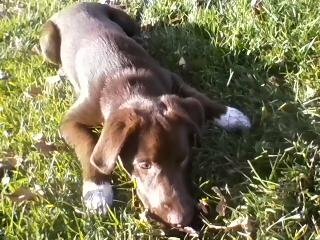 This is one of the first pictures that I ever took of Clark. I had already had him about a month. Clark is a lab mix, and being a lab mix, is mostly solid in color. Dogs that are solid in color are MUCH more difficult than the Australian Shepherd and Australian Cattle Dog. Both of these creatures were easier to do, as they are not as dependent on light location and subtleties to bring out facial characteristics. Anyways, this is the artistic process I used to bring out features of a single colored dog. 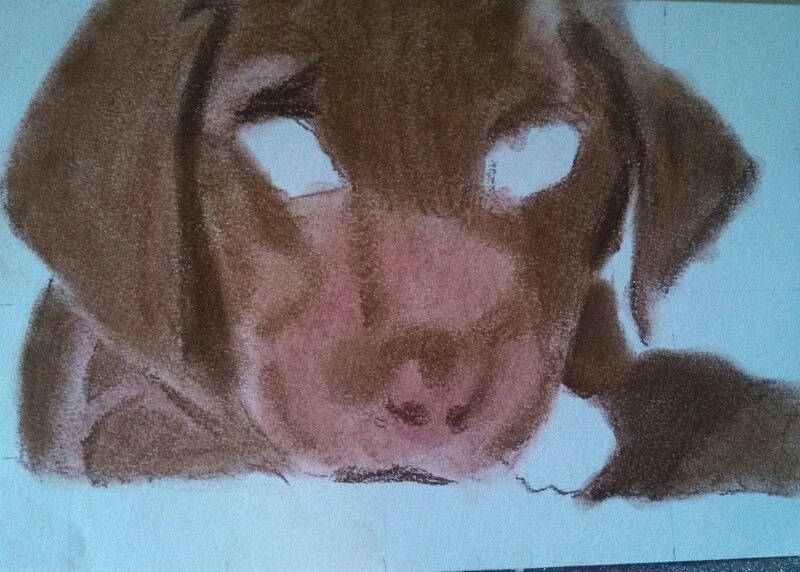 After drawing a pencil outline, I went through with a reddish brown (the color Clark is) for the base colors for the lighter area, and a light brown as a base color for the dark parts of the dogs face. Then I added some of the light brown over the reddish brown that will be darker at the end. Then I shadowed in the area under his ears with dark purple and black. After that, Clark was still too red. 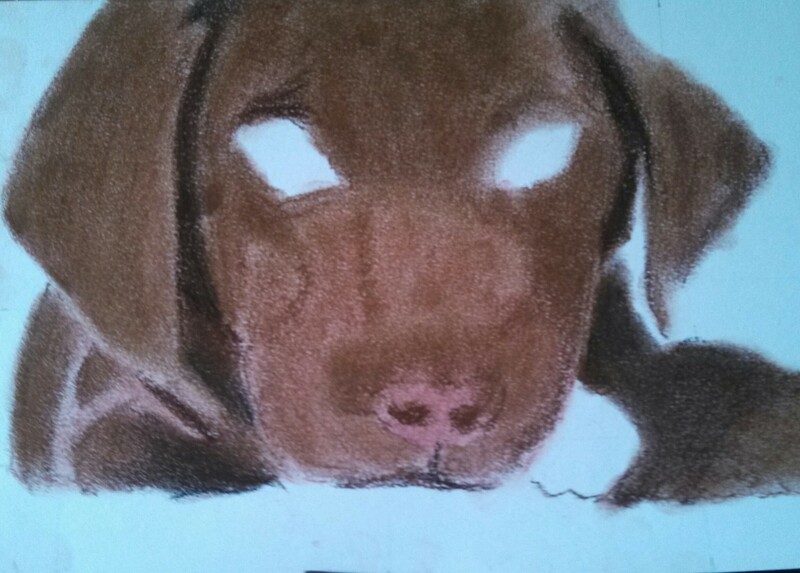 So I progressively darkened the dark areas to dark brown, and mixed the reddish brown with light brown. Now, in the light, solid colored dogs have a ton of reactions to the light. Because of this, I went around the eyes and face and added tinges of lavender, light grey, and light yellow to make the skull features stick out. Now comes the time to fix the alien like appearance! As dogs without eyes are CREEPY! 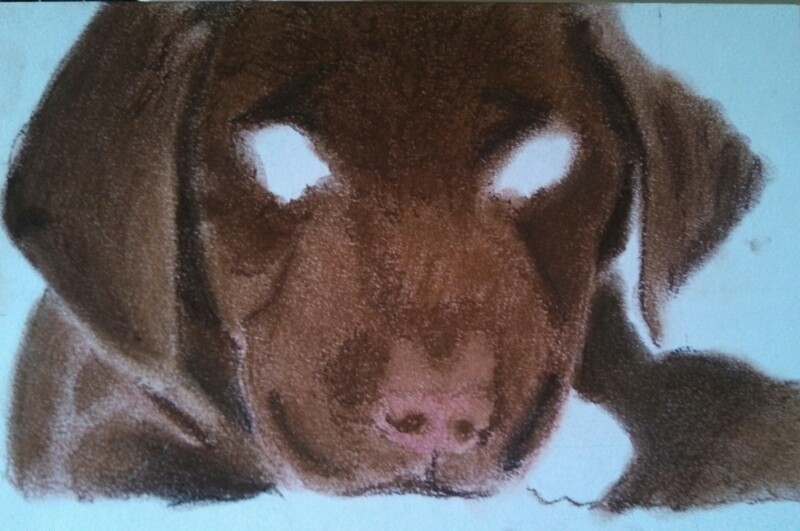 I left really big eye holes, as it is a puppy. Also, Clark has these amazing eyes, with a deep brown inner ring, and a gorgeous amber outer ring. What separates Clark from most other dogs is the white sock paws. These paws have brown freckles, so I added these. The next step is to adjust the eyes. 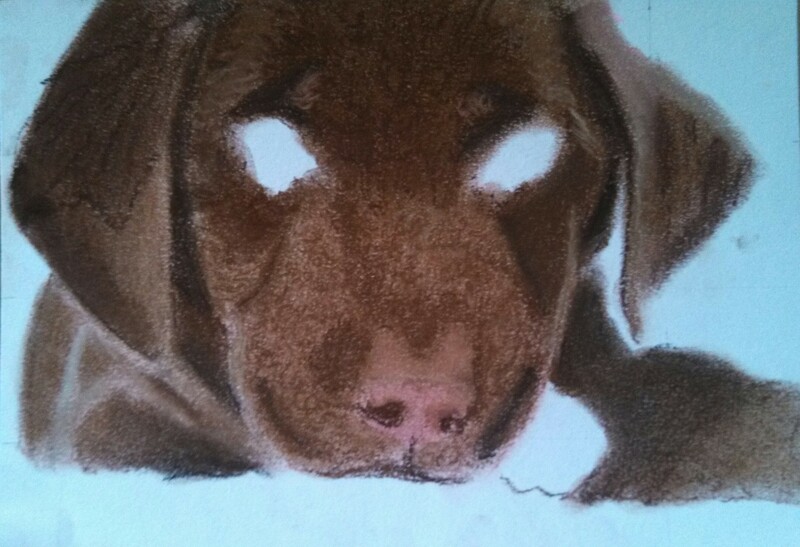 Next to Clark’s eyes are a light colored eyelid that needs to be added to shrink the crazy size of his eyes. 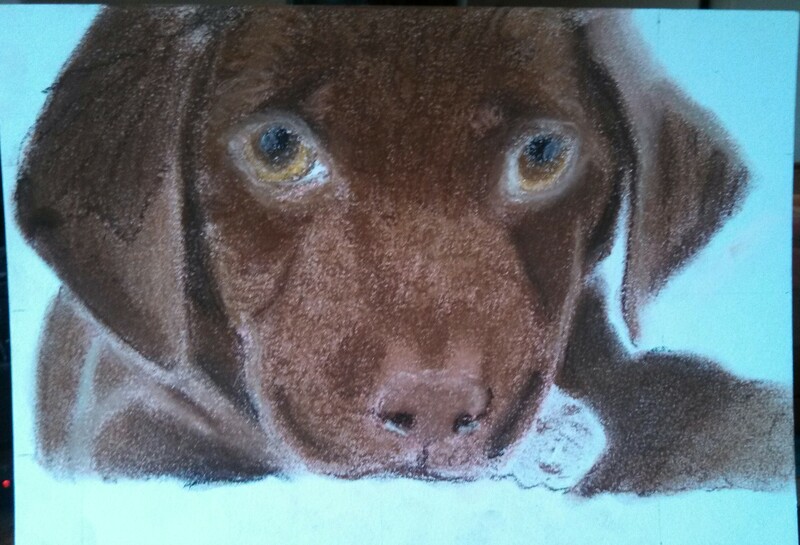 Finally, I switched to the hard pastels to get some more final details in. 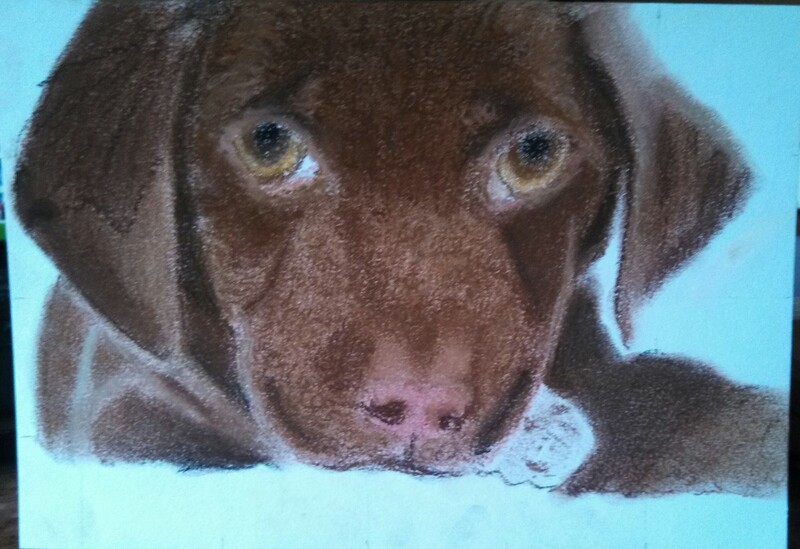 The nose color was slightly off, and the eyes need a twinkle. 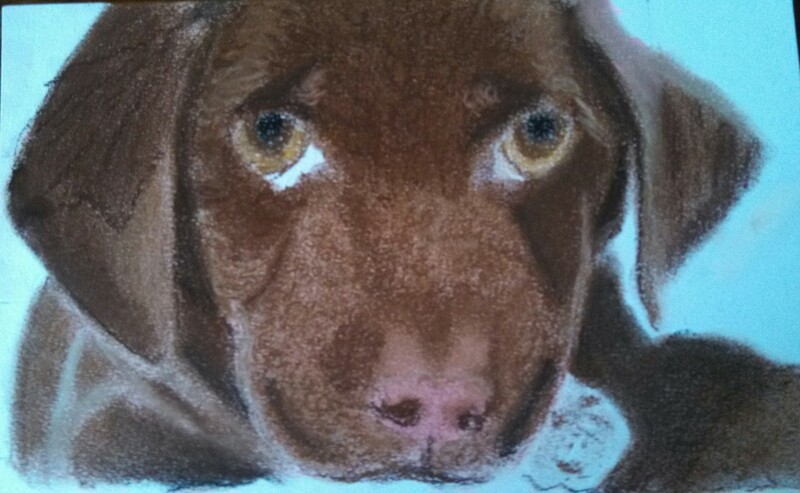 I am leaving the background white, as it seems quite innocent to me, and he is so dark. Some of the pastel color didn’t take as well as I wanted, so I think I may go through and touch him up, and add a BIT more hair definition.